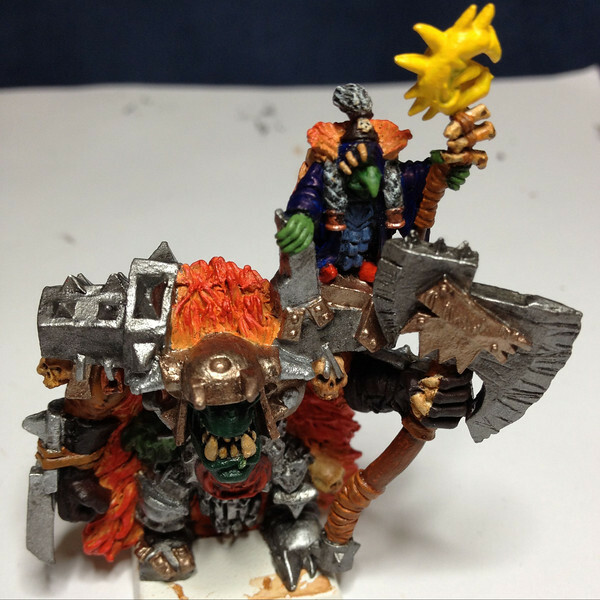 [Completed] WIP of Grumlok and Gazbag!! 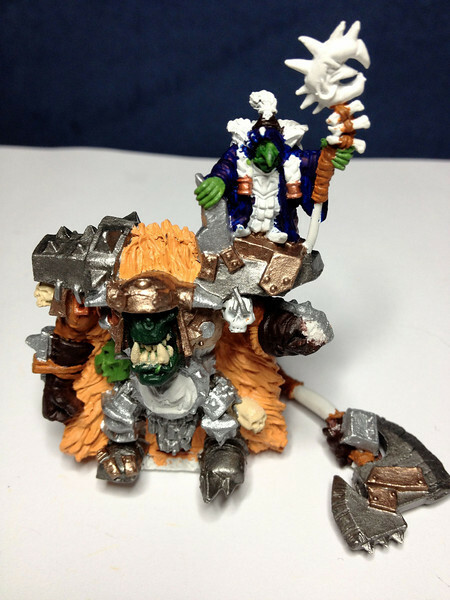 Subject: [Completed] WIP of Grumlok and Gazbag!! 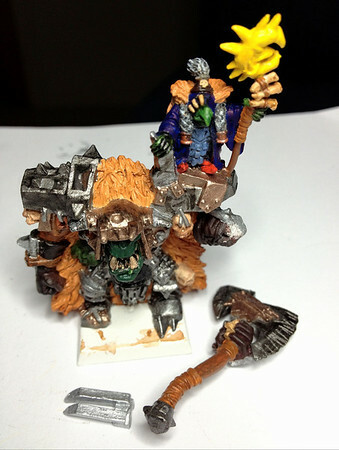 Last night I started painting one of my Grumlok and Gazbag figures that has been sitting in a drawer since the release of Warhammer Online (got it in the collector's box). 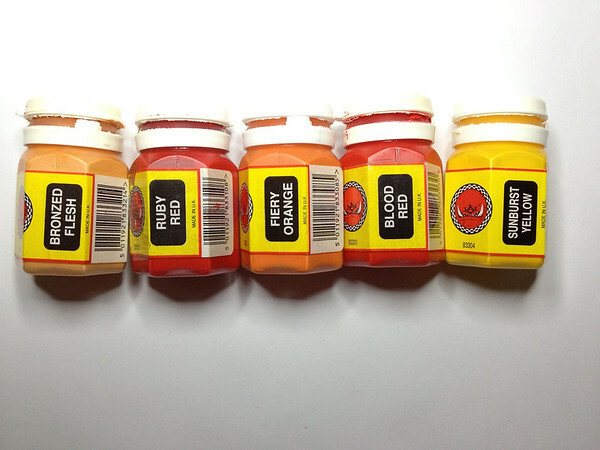 I'm not a big paint mixer, I prefer to use individual pots rather than try to create colours so that's why my paint selection for him is large. I'm going to try and do a little bit each night until he's done and post up the progress here. I've setup a paint station in the lounge room so I can watch TV with my wife and paint at the same time to make it a bit more social and hopefully that will keep me at it. 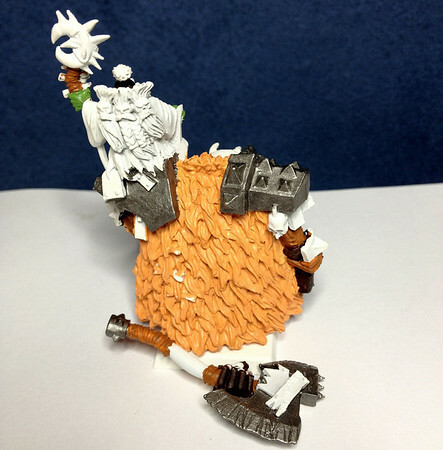 Current status after first night is the cloak based and some leather, arms done. 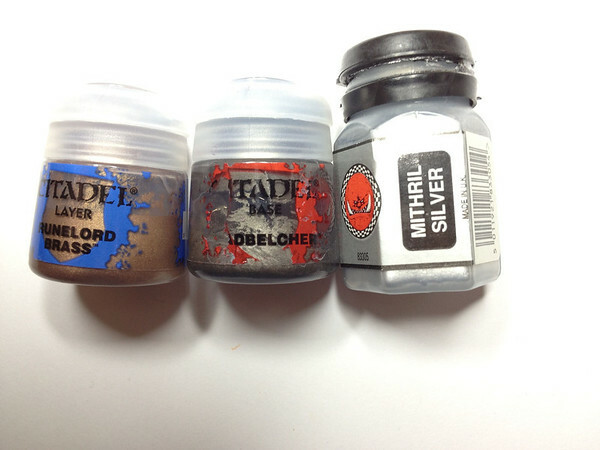 I'm going to get a lot of the base done, then do the washes (combination of Reikland Flesh, Nuln Oil and Black ink). Then after those are done, touch up base colours where required. Then finishing with highlights. 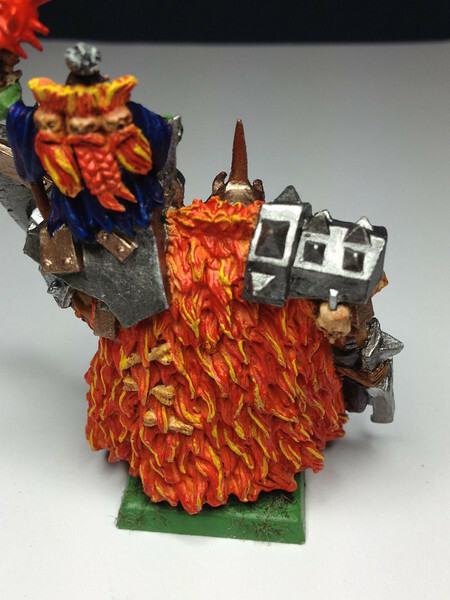 I picked a lot of vibrant reds and yellow etc for the cloak as I figure he would only have used the finest, brightest dwarf beards as a sign of status. 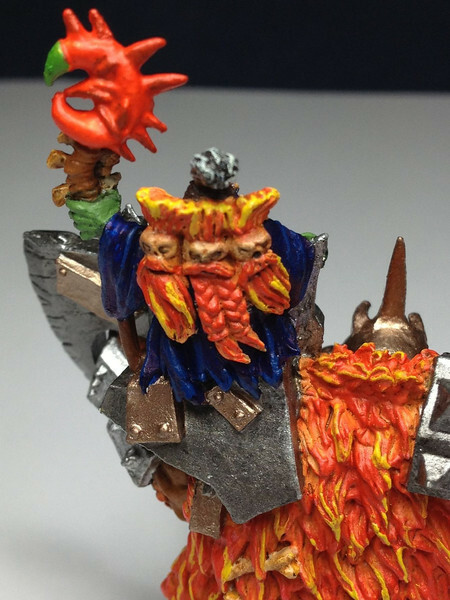 I'll be aiming for the cloak to look almost like flames when I'm done (fingers crossed). First time posting images to Dakka - feel free to comment or let me know if there is anything I can improve! Ok, another update from last night. Got through three episodes of Deep Space Nine in my painting session but have only a little bit to show for it. 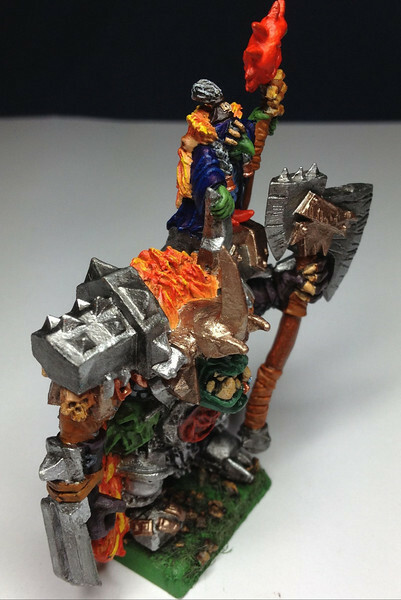 How do people paint a mini every few hours???? Have done a large part of the steel areas with lead belcher. 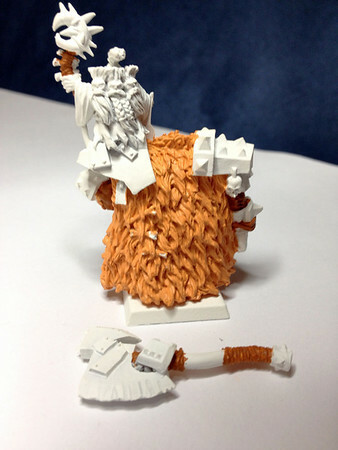 I want the darker hue as the raised and bolted on bits will be done in lighter tone like Mithril so they stand out. I also did most of the leather areas with Rhinox hide, I want them dark so the threads and patches can be done with snakebite or similar. 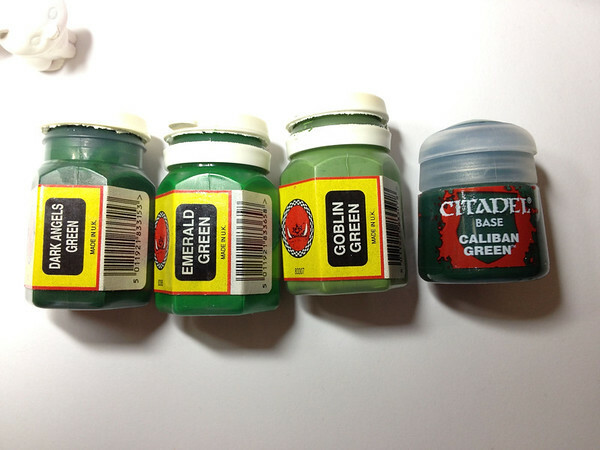 Finally I filled in some of the goblin flesh with of course Goblin green. I'm hoping that tonight I'll get a lot of the front blocked in with some brass, lead and silver. Haven't decided yet what colour I'm going to make his armour under the metal. It looks like he has some sort of padded or wooden armour under the metal plates. Once that's all done I can finally move on to the wash, which will bring out a lot of the detail. 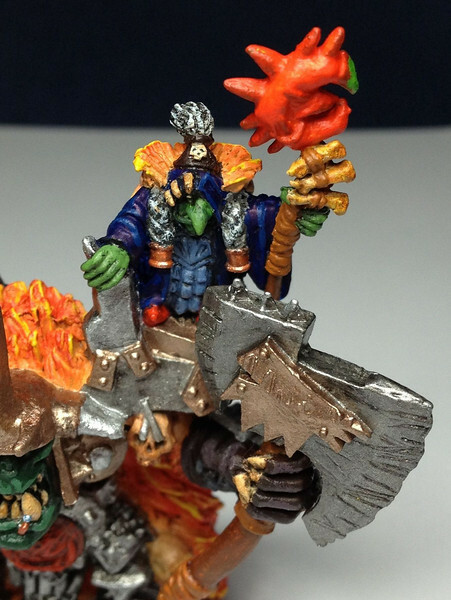 Then finish with the highlighting and touch up's. It should all come together with another day or two, fingers crossed. Well I wasn't able to get much done unfortunately due to a combination of a friend getting back from a deployment on Saturday and another mate visiting on Sunday. Then I had some Acrylic rack products show up and I've been splitting my time between painting and putting those together. A lot more of the metal has been done, the cloak and some skulls. 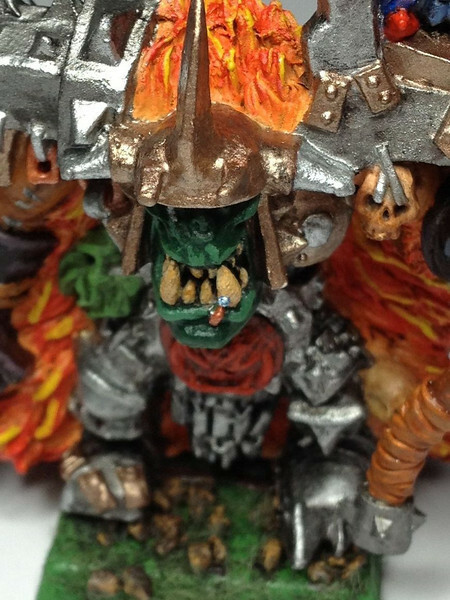 The face has been blocked in, again more metal bits and skulls done. It's starting to come together I think. Now just need to fill in some of the last details - chest pieces and whatnot. Before I finally get to move on to the washes and highlighting! Ok, here's the bit I hate. I was never very good at washing and texturing etc so I'm just hoping the model pulls through without me wasting all the time I've spent on him so far!!! 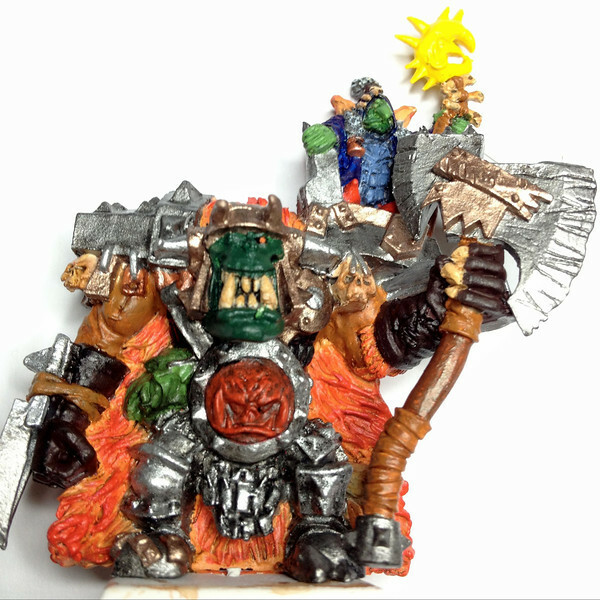 He's an Ork so I think he can take it. Between a combo of mostly Black ink on the metal surfaces, and Chestnut wash on the clothes, cloak etc I think some of the detail has been teased out. 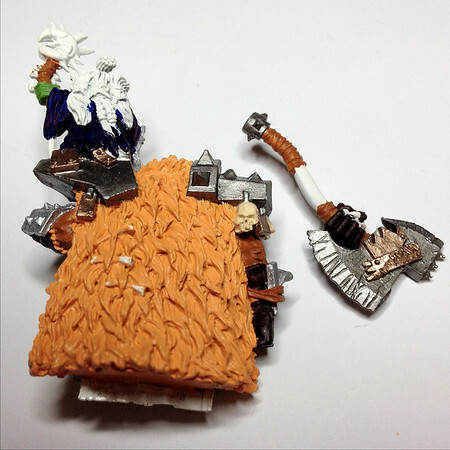 There are some aresa that got a little too much wash - the goblin's hand for example got smacked by the brush. However this is the stage where basically I'm aiming to weather and dirty up the surfaces. He's been in battles etc and shouldn't look pristine. From here, I try to make him look pretty again. 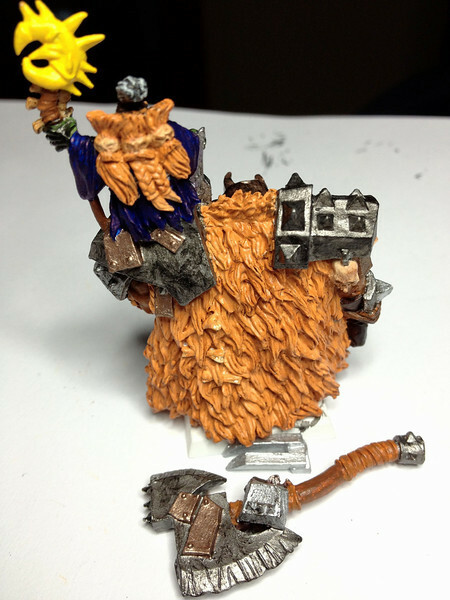 I finally get to start making the cloak of beards look real, I get to start dry brushing and adding shadings to fix up a lot of the errors along the way. Painting over places where the wash went wrong etc. 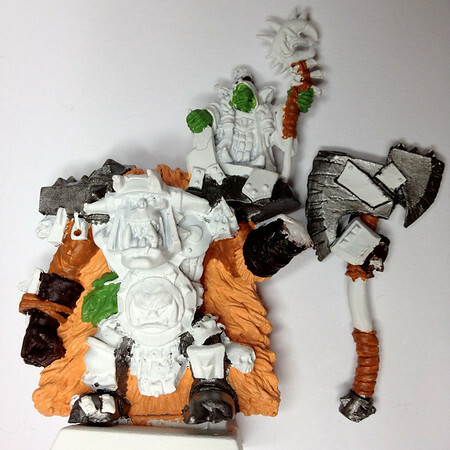 I'll also finish his breastplate. I'm going to shade in the black face with a red, blood type look. Then to finish, I get my smallest detail brush and go over the edges and lines to neaten everything and define details like Eyes and nails, teeth and glue on his axe, arm blades etc. I was just thinking of painting mine. The next big question is... what rules to use. Might have to start a thread and see what the dakkites can come up with. For myself I started painting him as pratice, however since then I've thought of a perfect use for him. 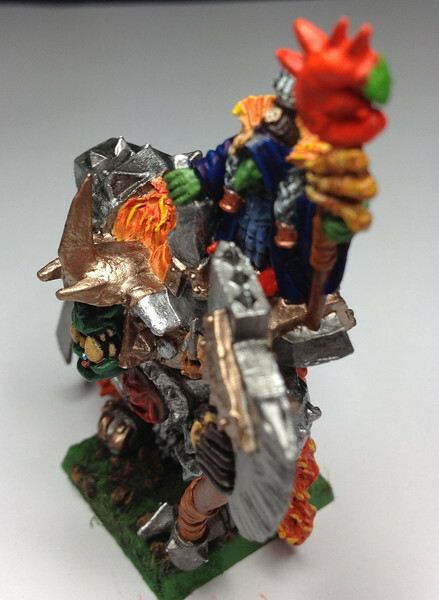 I'm going to give him to a mate of mine who plays Orcs in Mantic's Kings of War. 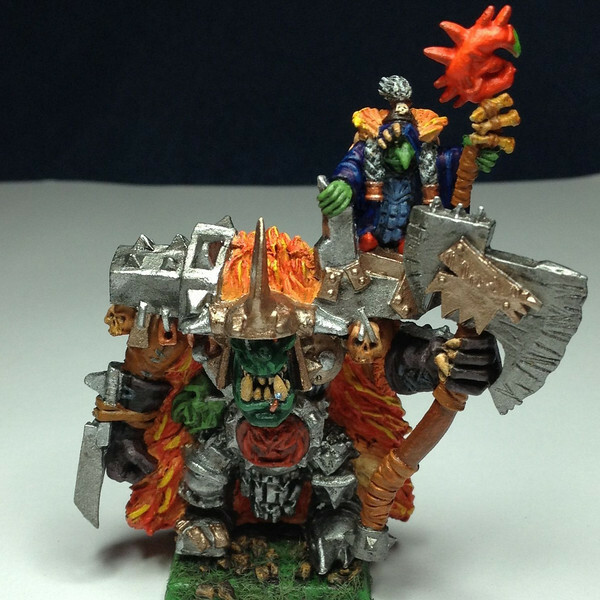 I think he would make a great alternate scult for an Orc Krudger with Zappy Sneak. 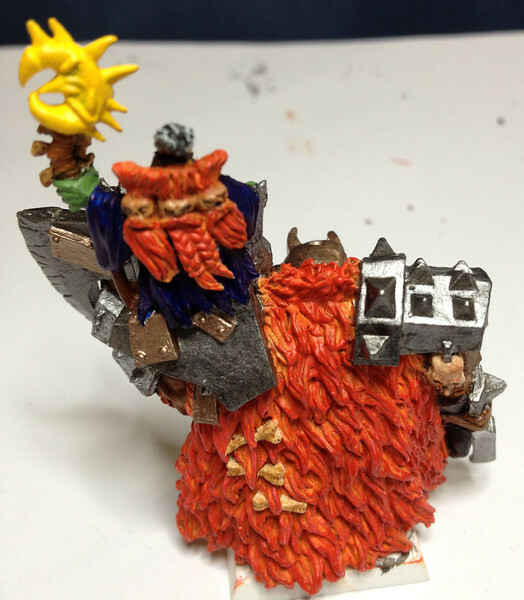 In the meantime, here he is almost completed. I'd say around 95%? I'm at the point where I would really like suggestions on how to finish him off. I've got some ideas to make the cloak stand out more - at the moment it's very "sunset orange", I couldn't get the red to really pop. 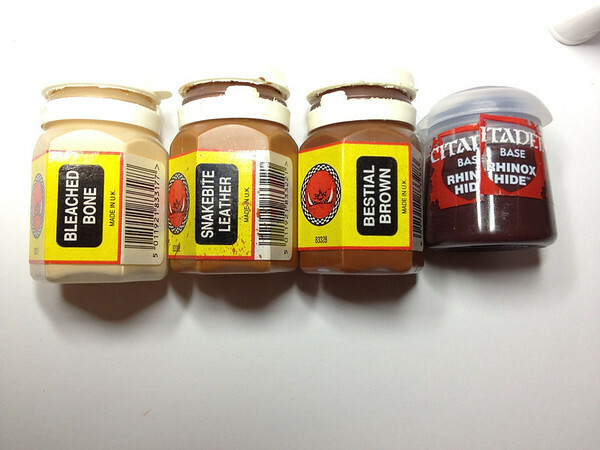 It started as bronzed flesh, then had a level of blazing orange applied and topped with blood red. I've tried mixing a few paints like white into it, and ended up just getting pink shadows. I've tried putting some grey hairs through the beards for variety, but that just made it look dirty. 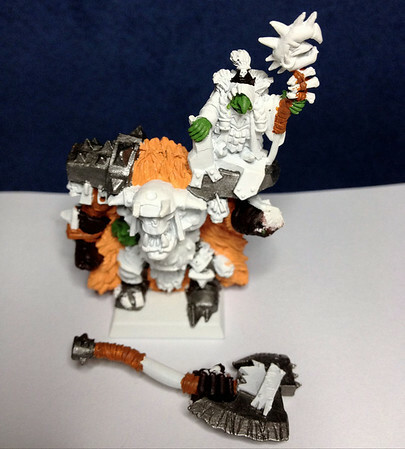 My next attempt will be some plain white drybrushed edging to see if I can lift it somehow. Otherwise I'll probably just leave it be, I've already lost a lot of the Bronzed flesh and Orange by having to repaint it two-three times after my experimentations. 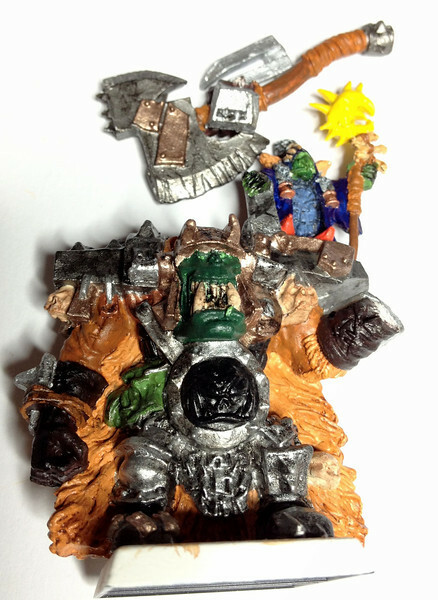 I've still got to clean up the goblin head attached to his belt. As well as put a bit of highlighting on his face, at the moment it is still just a solid Dark Angels Green and make his scarred / missing eye more obvious. Will drybrush a bit of grey / white on to the black armour you can see at his sides to give it a bit of detail. Again, anything I've missed that might improve him would be welcome!Finally I might put some sharper edging on the face in his armour. 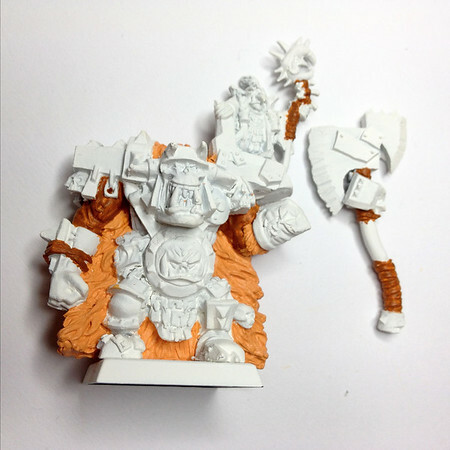 I still have to finish his base, fix one of the copper hair ties on the shaman and fill in gaps between the nails on his axe hand. And do his lip ring. I'm also debating if I'm going to put on his helmet spike, or fill the small hole and make it smooth. I'm leaning towards including the helmet spike, which I just need to glue on but was waiting until cloak was 100% finished so I have access to it behind his head. Well, he's nearly finished anyway. It has taken much longer than I originally thought to get him this far but I'm pretty happy with how I've managed. I'm thinking about moving on to my wife's Dark Angels Bikes next. For something completely different but also challenging. Plus she's been waiting 5 years for me to do them lol. Looks way better than mine. Good job. Thanks for the comment djphranq! Lots of pics follow of various angles and a few close ups. There are only three things left on him to keep in mind, so I'm happy to say finished for now and I'll just complete him tonight. The first is the Moon on the staff - I'm going to clean it up a bt and was half way through painting it last night when ran out of time. The second is his right foot, I was a bit harsh with the highlight, I'm going to tone it down a bit. The third is he still needs a coat of matt varnish once I'm done. You'll note he now has his helmet spike. 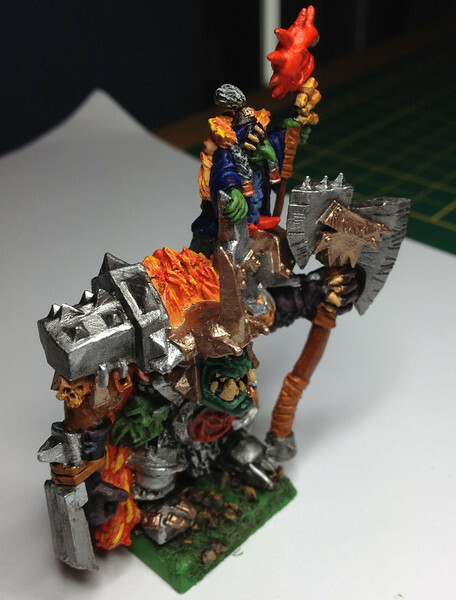 I had to use a bit of greenstuff at the base as it really didn't fit well, there was at least a 2mm difference with the curve of the helmet and the spikes base was flat. Well there you have it. I hope my mate is pleased with his present. I'm pretty stoked with how he turned out, not 100% sure on the diamond in his teeth but it's as good as I could do lol. Plus I need more practice with basing. The rocks turned out well, but have to get better at flocking, its a mess heh. 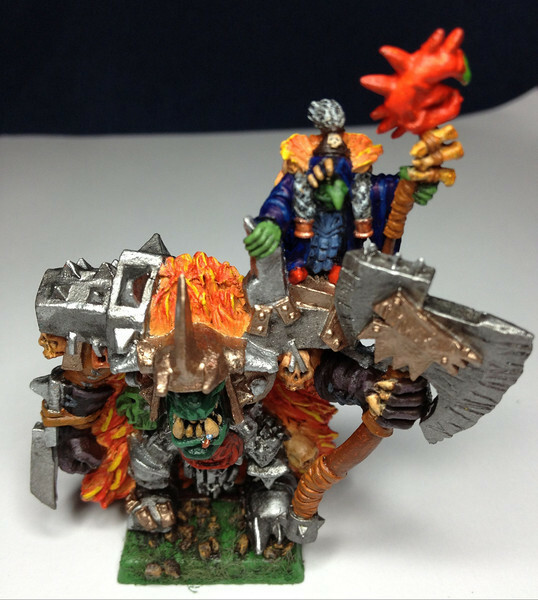 Thanks for reading and I hope you enjoyed this WIP of Grumlok and Gazbag!